We contribute to solving environmental problems through research on environment-friendly organic device design, enzyme/microorganism-based biotechnology, and hydrospheric biogeochemistry. The primary goal of our research is to develop materials and devices for use in optoelectronics, especially in organic light-emitting diodes. To gain a better understanding of the structure-property relationship of functional materials at the molecular level, we use quantum chemical calculations, solid-state NMR, dynamic nuclear polarization NMR (DNP-NMR), and optical and thermal measurements. Solid-state NMR spectra of light-emitting organic LED materials, Alq3. The isomeric states of Alq3 determine the fluorescence wavelengths. (1) Biogeochemistry of trace elements in the hydrosphere: Novel analytical methods are developed for trace elements and their isotopes (TEIs). The distribution of TEIs in the hydrosphere and its effects on ecosystem are elucidated. 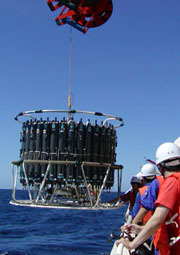 TEIs are also utilized to investigate hydrothermal activity, deep biosphere, and paleoocean. (2) Ion recognition: Novel ligands and ion recognition systems are designed, synthesized, and characterized. Two-dimensional molecular aggregation is a unique chemical field in which molecular interactions and the substrate surface predominantly influence the molecular structure and properties. To understand the chemical structure, the properties and reactions in an ultrathin film, the keywords of molecular interactions and orientation are additionally employed, and the fluctuated molecular aggregates are investigated by originally developed spectroscopic and theoretical techniques. A polymeric compound spontaneously forms double-strand helices with a perpendicular stance to the substrate. When a minute amount of water is added to the polymer, the helices come apart and are fully extended. (1) Studies on the molecular basis of environmental adaptation of extremophiles and their applications. (2) Mechanistic analysis of microbial enzymes with unique catalytic properties and their applications. (3) Studies on the mechanism of construction and functionalization of biological membranes. 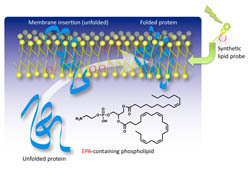 Function of phospholipids containing polyunsaturated fatty acid in the cell membrane of cold-adapted bacteria.